What is this tutorial exercise all about? This tutorial is a simple painting exercise to illustrate the use of the various painting tools. It is meant to familiarize the user with the tools and the Chasys Draw IES Artist environment in general. 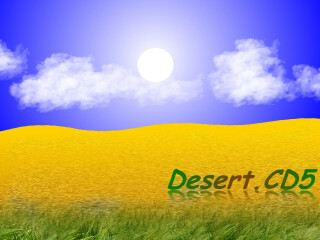 We are going to paint one of the sample images, "desert.cd5". This is a rather simple painting that does not include any of the more advanced features such as layers and the like, but it is simple enough to do within five minutes or less, and is a good starting point for a beginner. On the toolbox, click the Gradient Fill tool button and select the color gradient, ellipse option (first column, second row). If you don't have the toolbox on your screen, go to the menu, select Window then select Toolbox. Confirm that the alpha#1 setting on the toolbox is set to 0 and the alpha#2 is also 0. 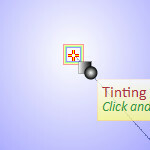 Move the mouse pointer to a point just above the center of the image and click the left mouse button. Move the mouse pointer towards the bottom right of the image until the image is filled as shown, then click again to set the second point. If you are not getting deep blue at the second point, check if alpha#2 is set to zero (0). Note that you can move any of the points by using the left mouse button to drag. The selected (and currently dragging) point is shown highlighted; the highlighting is indicated by multi-colored rectangles as shown below. Experiment a bit by dragging the point is your image to familiarize yourself with using the dragging handles. 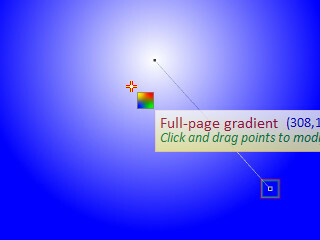 Once you have positioned the gradient properly, you can right-click (or press Enter) to apply. If you have trouble finding the center, you can bring up the Grids and Guides under the View menu) to help you. On the toolbox, select the Shape Tool . 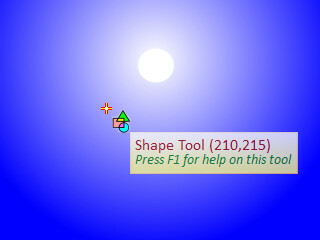 This tool brings up a list of shapes to choose from. Choose the filled circle (second column, second row). 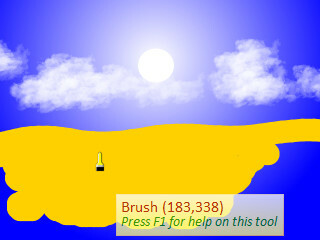 Using this, go back to your initial point, click then move the mouse until you get a reasonably sized "sun", then click again. Note that you can use the mouse wheel to zoom in and out and to pan as you try to decide where to click (see Preferences for details). Right-click (or press Enter) to apply when satisfied. 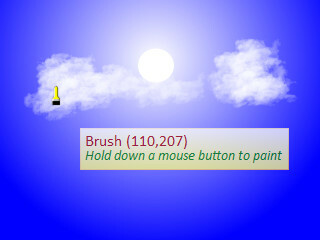 Please note that you can also get this option by right-clicking the brush gadget . If you find difficulty in following the next three steps, try achieving the same result using the Brush tool only. You may find it much easier to use, but the results may not be as good. On the toolbox, click the Curve tool . A tool width of 32 wouldn't hurt. Left-click a point just outside the image to the far left of the image, halfway from the top. 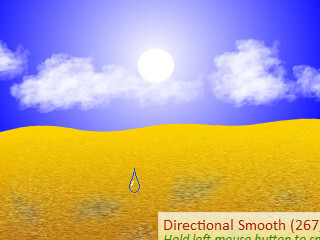 Left-click the point you want to be the top of the hill, then a valley, and proceed till you reach the far right. 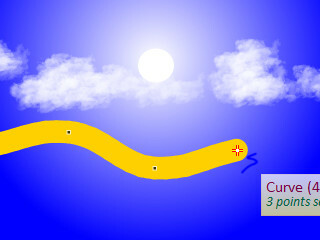 Right-click to end the curve. Adjust the points if need be by dragging them with the left mouse button, then right-click again to finish. Now for some perspective... At this point, I'll assume that you are now getting comfortable with the tools and are willing to experiment for yourself, so I'll let you do some exploring by giving you open-ended instructions. On the toolbox, select the GT Shape tool , and choose the vertical rectangle option (option 2). Now try doing this. If you make a mistake, just select Edit, Undo from the menu or use the shortcut keys Ctrl+Z. Now for the final step... On the toolbox, choose the Smooth tool , and choose the directional option (option 2). Set the tool width to 50 pixels and try doing this (Hint: hold down the left mouse button). Select the Hand tool from the toolbox and use it to right-click the image for a list of options. Choose "Duplicate Layer". Working with this duplicate, select the Eraser tool from the toolbox, and use it to eraser the entire duplicate. 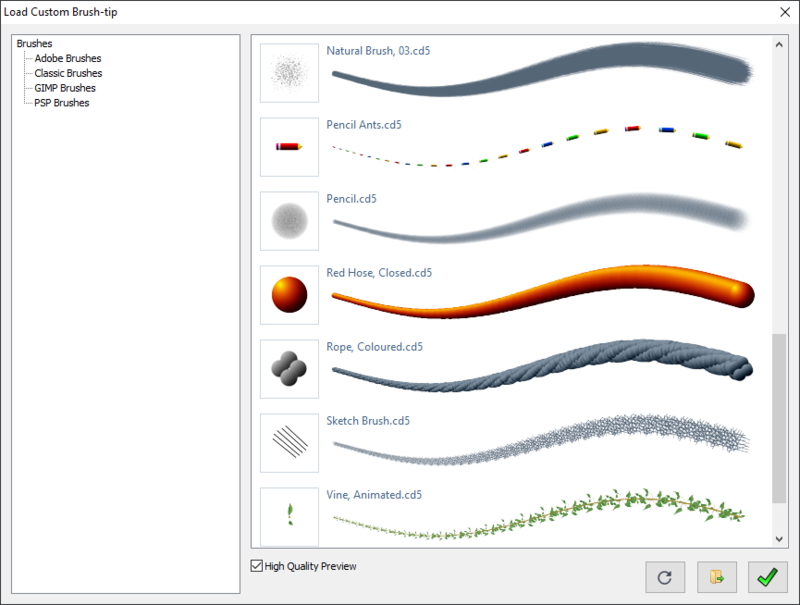 Select the Brush tool , and load the "grass_animated" custom brush. Use this to paint in the grass. Your image should look something like this. 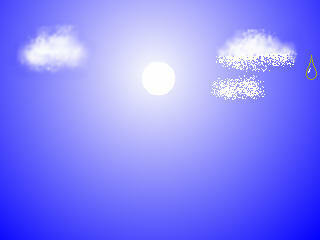 Select the Gradient Fill tool and choose the Transparency Gradient option (option 3). 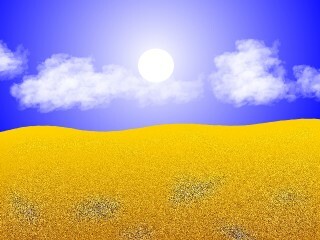 Using this, make the top part of the grass transparent, with gradient towards opacity as you approach the bottom. Remember to set alpha#1 and alpha#2 appropriately (0 and 255). You can then add text using the TextArt tool. Just use the styling options provided in the TextArt dialog to decorate your text (I used the "reflection" render style). That wasn't so hard, was it? You are now familiar enough with the Chasys Draw IES Artist environment to start experimenting with the other tools. Happy drawing!